Some days. You know the ones. Nothing plays out as you intended. Plans are broken, objectives lost. Your to-do list doesn’t have any checks in the margin and the later it gets, the less likely it seems that you’re actually going to get around to making dinner. But, dang-it, dinner was the thing on that list you wanted to make time for. These are the days you need a dish like this salmon in your arsenal. 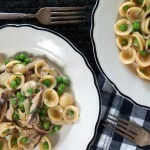 You need to be able to just throw a bunch of ingredients together, toss them in the oven, and be treated to a great dinner half an hour later. 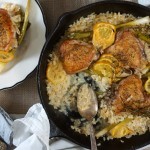 A 1-pan situation is critical–you certainly don’t want to end the night with a stack of dishes or start tomorrow with a hideous wreck of a kitchen–and it’s got to be healthy because even though you had the best intentions, that jog you were planning on just did not get checked off the list. This salmon is just the dinner to cap these sorts of days. 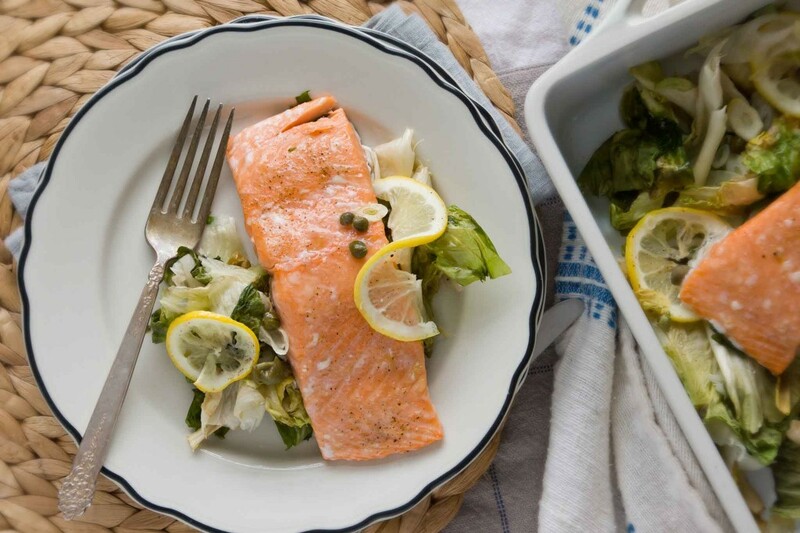 It’s nothing but good-for-you fish, slow roasted on a big mound of escarole with briny capers and fresh bursts of lemon. 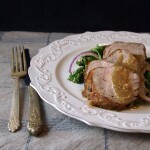 Thanks to the magic of roasting at a low temperature, the fish stays beautifully moist. The greens wilt down with a few crispy bits here and there. It’s the kind of dinner you can get in the oven with 2 minutes of prep, then have 30 minutes to tear around the house, trying to make good on the to-do list…or enough time to decompress with a glass of wine. Take your pick. Aaaand…go! 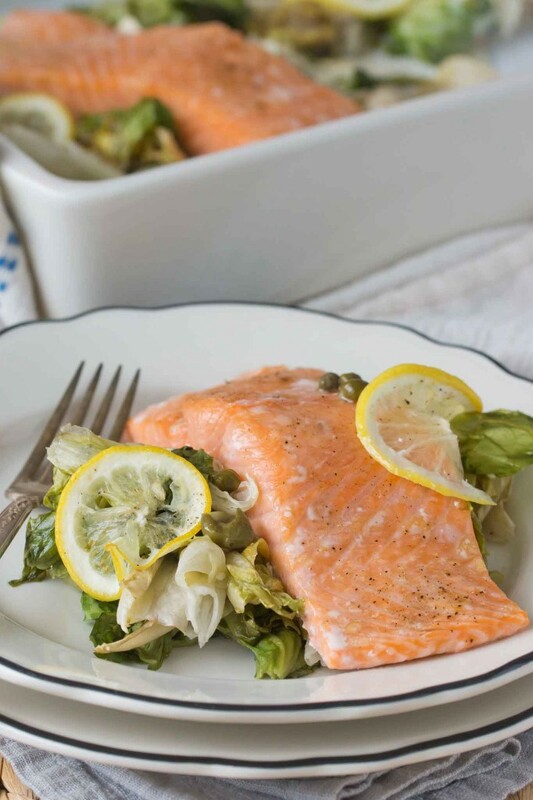 We just need a few ingredients: salmon, a head of escarole, a couple of cloves of garlic, a few lemon slices, and a forkful of capers. Olive oil, salt, and pepper and we’re off and running. Rip the escarole into pieces, throwing it into a baking dish as you go. Add some lemon slices, capers, and garlic. Drizzle in a bit of olive oil, hit it with the salt and pepper, and give it a toss. 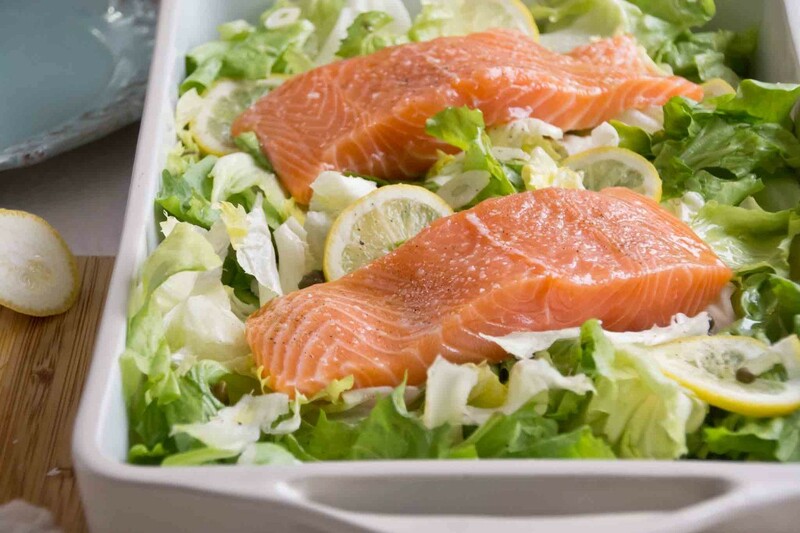 Set a couple of salmon fillets on top of the greens. Drizzle the fish with olive oil and season. Dinner prep is officially finished. Pop that pan in a low oven and go kick back for half an hour. Before you know it, the greens will have wilted and the fish will be ready. If you’re wondering how on earth anything that’s “slow roasted” can be considered a quick weeknight dinner, just keep in mind we’re talking about a salmon fillet, not something like a pork shoulder. 30 minutes is all it takes, truly and magically. Sit down to dinner and pat yourself on the back. Looks like you accomplished something today after all. Slow roasting salmon is my new favorite trick. It really only takes 15 minutes longer than my quick roasting method , but the fish cooks more evenly and remains entirely luscious. 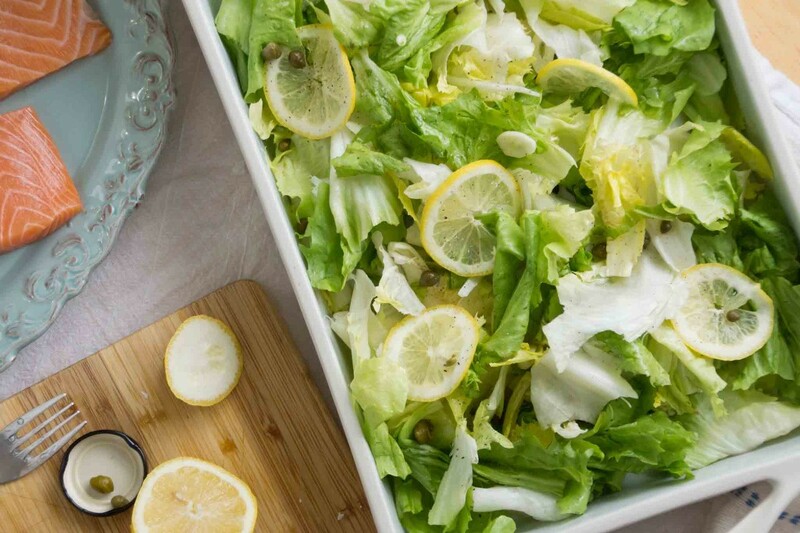 Place the escarole, garlic, capers, and lemon slices in a rectangular baking dish. Toss with 1 Tbsp. olive oil, salt, and pepper. 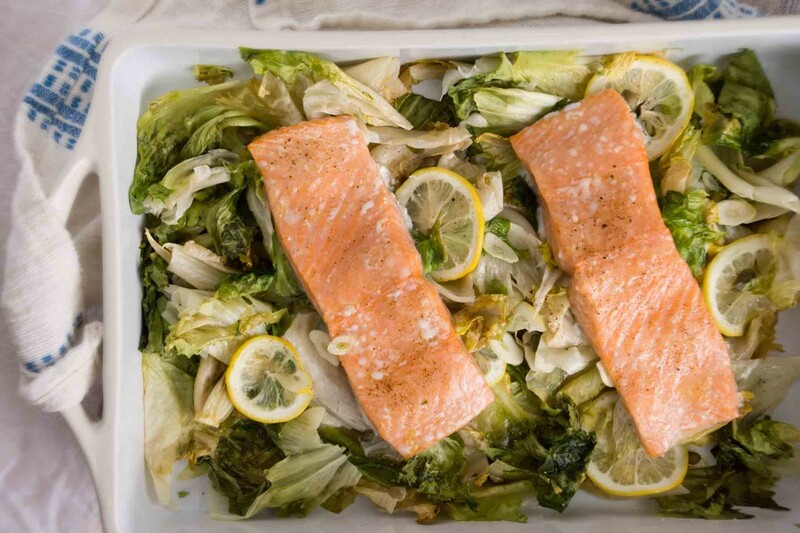 Place the salmon fillets atop the escarole. Drizzle the remaining oil over the fish and season the fish with salt and pepper. Roast until the salmon is just opaque and the greens have wilted down, about 30 minutes. 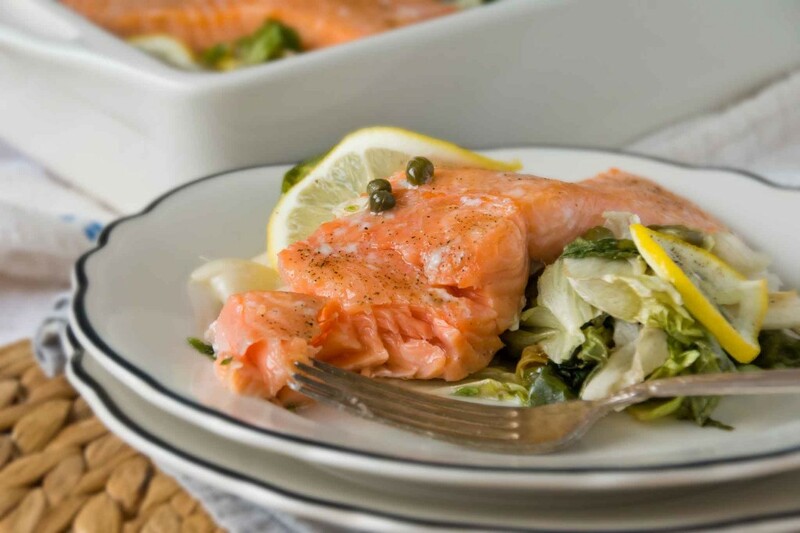 Divide the escarole between warm plates and top with a salmon fillet. This looks great! I love salmon but really hate it overcooked. Will have to try this. Curious — do other types of fish filets take as well to slow roasting? I’m thinking specifically of cod as I inherited a bag of frozen filets from a friend moving. Thanks! 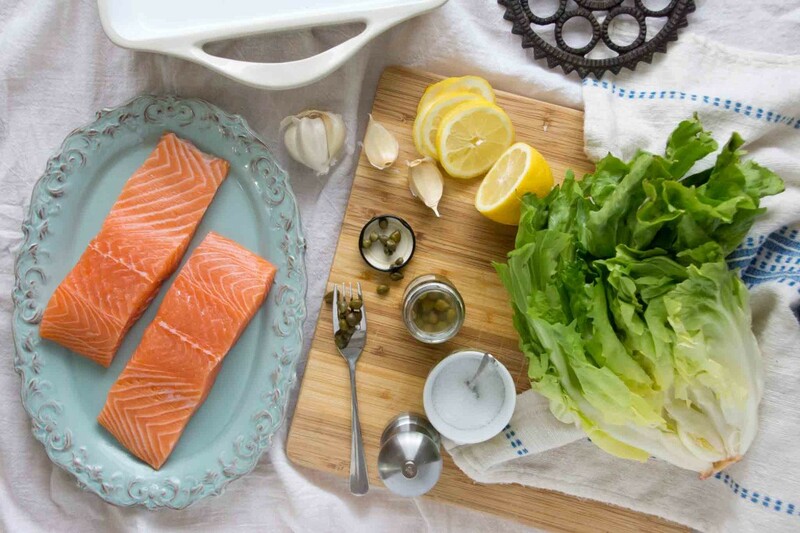 I agree about hating over-cooked salmon–it’s the worst! The slow-roasting method will result in very moist fish, that is just barely opaque. I imagine cod would work very well too, I’d just start checking doneness a little sooner. Sounds perfect! Can’t wait to try it. 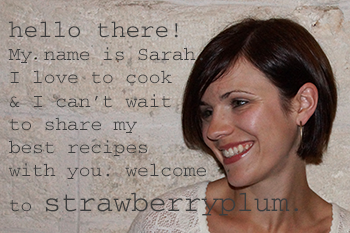 Thanks Sarah. This looks great! I’ll be making it during Lent for sure! Oh, you’re such a good (almost) Catholic! That salmon looks melt-in-your-mouth good… Perfectly cooked, too. Nothing worse than overlooked salmon! I love the pictures as well. Yum! Made this last night and will make it again! Thanks.